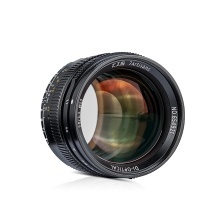 Manual focus prime lens for Leica M-Mound mirrorless cameras. F1.1 large aperture, giving you better background blurring effect and making shooting objects more prominent. 50mm focal length enables you to take more professional and more vivid photos of portrait and landscapes in your daily travels. Aviation aluminum alloy full metal body with anodic oxidation treatment surface; brass inner core adopts for sonnar structure. Note:Please contact our customer service if you didn&apos;t find the camera model you want on the above list.